Now showing at Creative Tile. 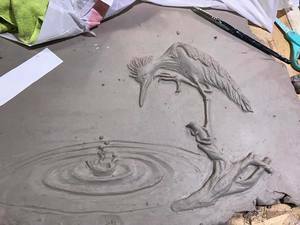 David Roberts, owner and artist of Carved Clay, is a former high school teacher and general contractor who decided leave his teaching career behind and follow his bliss. After plenty of trials and errors, Dave came to the conclusion that he wouldn't be fully fulfilled in life until he gave his dream of being an artist a try. Since his decision, he has been quite successful. His main focus is incorporating mosaic design into clay and creating custom works of art for homes. This art is centered around fireplaces or other wall space for kitchens bedrooms, and more. His craft is truly one of a kind. It has an old school style, and he is currently aiming to continuing growing his business. David also recently received a congressional award for a historic house restoration in the Tower District of Fresno, CA. We were so inspired by his story that we reached out to learn a little bit more about Dave, his art, and how to take the risk and follow your own bliss. Tell us a little about yourself. Did you always know that you wanted to be an artist? At Berkeley High, I took all the elective art classes. I took additional classes at California Arts Academy in Oakland. I received a minor in Art at Western Washington University in Bellingham, Washington. I never believed I could make a living at art, so I ignored it as a professional possibility after college. It did however infiltrate all aspects of my working life. My Aunt, whom has a masters in art, encouraged me to re-engage in the art world. During construction slump, while kids were in school, she taught me to work with clay. As a medium I had never worked with, I found it similar to woodworking. The lines, movement, cuts, and colors are similar to the artistry in fine cabinetry construction. For my first project I took on my 9’ by 6’ Old Fig Garden fireplace as to challenge for myself. My goal was to cover it in ceramic tile. The scene I created was a rendition of the Central Valley complete with Valley Oaks, Tule Reeds, and Blue Herons. I immersed myself in the profession. I found clay work exceptionally calming. After many re-constructions, the end result was amazing. With encouragement from my family, my wife and I decided to turn my interest into a business. Now we are going for it. Tell us a little bit about your time as a teacher. What was your inspiration? With a Teaching Credential from Mills College, I taught science to sixth through tenth graders in public schools in Oakland, California, and helped open a private school in Reno, Nevada. 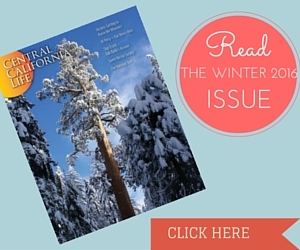 In all my classes, I melded science, art, and the natural world while emphasizing hands-on experiential learning. For example, I had students build six foot Mayan Calendar renditions in a cross-curriculum science unit. My love of exploring the natural world and art led me to receive a BA in Marine Biology from Western Washington University. I interned in Bermuda and helped establish Pre-Baikalski National Park in Irkutsk, Siberia. I now spearhead projects to plant endemic Valley Oaks in the Fresno Unified School District. Tell us a little bit about your time as a teacher & contractor. Did you ever think you would leave to become a full-time artist? As a teenager I apprenticed in construction in Berkeley. 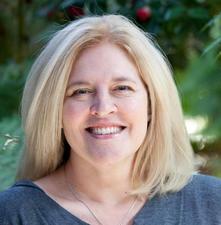 Post teaching I apprenticed on multi-million dollar homes in the hills of Los Altos. I used top grade materials, and learned from true craftsmen. I now consider myself a master craftsman. In Fresno I became a General Contractor and ran a small remodeling business. I have transformed multiple older homes and gardens. I respect the craftsmanship and materials of the past and enjoy bringing them back to life. On one restoration of a hundred year old historic house in the Tower District I received a congressional award. I have intimate knowledge of architectural space and how to enhance it. As construction disintegrated in 2008, I was able to focus on a more important job, my two pre-school age children. In parenting, I drew upon my teaching skills and encouraged their participation in projects requiring a combination of science and art. For example, they built abacuses using heavy machinery. They are often by my side constructing their own clay creations. What are your goals for the future? What will you focus on? My primary goal is to grow into a small, financially independent business run by my wife and me. We would like to focus on larger installations at homes and businesses. As the business grows, we will focus on public installations local, nationally, and abroad. All pieces will emphasize the natural environment. Do you have a favorite medium you enjoy working with? I work with two types of clay: Dixon Sculpture and Vegas Buff. Dixon Sculpture is a deep red, high fire clay. With a high grog content, tiles are cut larger, and sculpture detail is made in bold strokes. Vegas Buff is a high fire white clay, similar to porcelain. Tiles are cut smaller and finer details are possible. Both clay bodies transform into tile for use indoor and outdoor. My favorite glazes tend to express variegated coloring. I enjoy working with Shino glazes. Color breaks at relief peaks, and pools at valleys. The variation is unpredictable and beautiful. My wife and I are presently developing our own line of glazes. Custom tiles and bas reliefs. I create home identity and memorable landmarks for commercial properties. Inspiration for my reliefs derives from the natural environment. Work and study in the natural world carried me from the Reefs of Jamaica to the jungles of the Congo. Each region is unique. 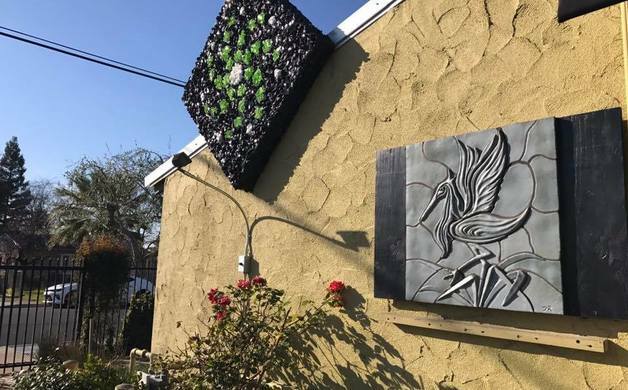 Each mosaic I create is unique to the region in which the client resides. 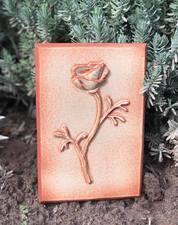 Tell us more about your work with Clay Bas Relief. Creating my reliefs is a natural evolution of my varying careers. Preserving the natural world remains a central force in my life. All my reliefs focus on the specific ecosystems. Clay work fulfills a similar desire I had for teaching. Rather than mold young minds, I mold clay into beautiful works of art. As a contractor, I have intimate knowledge on installation process and tolerances. Creating bas reliefs combine my knowledge of building with my passion for ceramics. I possess the technical skills to implement well crafted design and bring elegance to space. Parenting provides opportunities to teach, build, and create with my children. It allows me to work along side with them in creating a family business. What's been one of your most memorable moments while working with your art so far? I love challenging myself. Creating the bas relief for my fireplace transformed my life. The challenge of learning and succeeding at a new skill brought me great confidence and joy. I found I loved the process. It was such a calming/meditative force in my life. I knew I wanted to make this my next career move. It combined so much of what I enjoy in life. Do you have any advice for someone who is hoping to pursue their bliss, but are scared to do so? Make your life’s work impact the next seven generations. Change careers five times per lifetime. Life is too short to be bored. Death is final, everything else is worth the risk. I have much support and encouragement from my wife and family. They support me in following my own path. By following my bliss and dismissing self doubt, I have been the most happy I have ever been in life. How can someone get ahold of your work? Are you selling your art? You can visit my website at carvedclay.net or visit the Carved Clay Facebook page. Email me at robertsedavid@gmail.com or call at (559) 709-8702.
a. Individually created bas relief for the interior/exterior of a house/business. b. Bas Relief from molds for the interior/exterior of a house/business. c. Customized concrete address plaques for individual houses or neighborhoods. 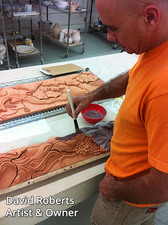 To learn more about David and Carved Clay, visit his website at carvedclay.net or visit the Carved Clay Facebook page.